The type species, Iris sibirica, is a fully-hardy rhizomatous, beardless iris with narrow, grass-like leaves and branching stems bearing up to five blue-violet and white flowers in summer. There are numerous cultivars. Iris sibirica var. flexuosa is a white-flowered form with crisped segments. To 1.2m. [RHSE, Lynch, Hortus]. ‘Native of Germany, Switzerland, Dauphiny, Siberia, and, according to Gmelin, of Kamtschatca; said to be generally found on the outskirts of watery meadows. We cannot otherwise account for Murray’s terming the corolla of this variety "bearded" than by supposing, that he has described from the engraving which accompanies his account of it, and has mistaken the lines that were meant by the artist to represent the veining on the inner side ofthe unguis of a detached outer segment of the flower given in that plate, for a “beard." The flexuose-undulate upper stem-leaf is neither constant in nor peculiar to the present variety. The bloom, which is produced about June or July has a slight degree of fragrance. A hardy plant, of easy culture, and known to our gardens for these two centuries past.’ [BM t.1163/180]. Iris flexuosa was introduced to Britain from Germany in 1810, and I. siberica in 1596. [JD]. Listed in the 1850 and 1857 catalogues [B.233/1850]. Possibly obtained from Kew Gardens, brought out from England by Captain P. P. King in 1849. 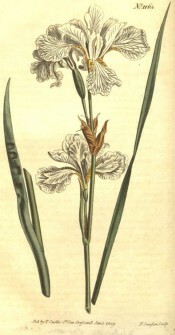 The confirmatory list sent by Macarthur to King simply records ‘Iris roots’, but this is the only plant first appearing in the catalogues in 1850. [MP A1980-3].